In the interest of providing our customers with a safe procedural way in which to transfer UO account access from one individual to another, we would like to remind you of our Origin Account Access Transfer Program. This program allows you to carry out the transfer process officially through the OSI Billing Department, ensuring that in case of any dispute, we can verify the correct owner of a specific UO account. By simply arranging for signatures from both parties involved, completing a confirmation phone call with an OSI representative, and arranging a small transfer fee, your access transfer will be secure and final. Additional details on the Account Access Transfer Program, and the appropriate form, can be found here. Due to the recent collapse of Vor's old Messagezone service, many of our messageboard links here at the press will become inoperational. If you would like to help us update any of the links or know of new messagesites for different entities, please feel free to post them to us here, or you can even send an e-mail to the following address. Thank you for helping keep Baja linked. OSI: BNN Reports on Paladin's "Homecoming"
The following article was posted at BNN at the Ultima Online Web site. This article, originally found here, is the fourth in the series of articles that relate to the currently ongoing, cross-shard "Orc Quest" being run by OSI. His polished armor shining brightly in the sunlight, the young paladin rode through his beloved city of Cove. Duncan had only returned to his city of birth a few days ago, after many years of questing. He knew it was time for some much-needed rest before once again traveling to the far reaches of Britannia in search of those in need. Duncan was proud of his city - a place of hardworking men and women, most of whom had left the larger cities for the excitement of a �frontier� town and the hope of a new life. The paladin�s thoughts turned bleak as he considered that new life. Cove was not what it once had been. Granted, there had always been the threat of the orc fort nearby, making it difficult to maintain a steady sense of peace, but something had changed recently. Scattered reports of movement by the orc tribes continued to come in, yet there seemed to be no sense of purpose behind the orcs� actions. �Twas easy to understand the mind of an orc. Battle, blood, the conquering of all, the taking of land� these were the things that made an orc. These reports, however, did not reflect a steady march of orcs sent to conquer new land. If Duncan did not know better, he would almost say it seemed as if the orcs were being scattered. They were not marching towards a goal, they were running away from some unknown menace - and it was towards Cove that they fled. As he turned a corner, Duncan spied a boy, no more than fourteen, running towards him. The boy�s leather armor was in tatters and a long gash could be seen on his right arm. He stumbled a few times as he ran towards the paladin, obviously shaken and in pain. Duncan immediately dismounted as the boy reached him and began applying a bandage to the boy�s arm. "M�lord, they�ve broken through the outer wall!" the boy cried, his speech interrupted by weak coughs. The paladin�s crimson eyes went wide. "What are you talking about?" "Orcs, m�lord! Dozens of them! They�ve already slaughtered most of those at the wall and are making their way into the city." "What of the guards? Cove still holds a small regiment of the king's men, does it not?" "I don�t know, m�lord. The guards seem pre-occupied with their patrols and regiments. And many have already left to defend Britain and Trinsic against possible attacks." The boy winced as Duncan tightened the bandage. "But the orcs are not attacking either of those cities, nor does it look as if they will." "Blast! So it seems we of the smaller towns are left to fend for ourselves, then!" yelled the young paladin, his tired eyes turning cold with rage. "Rally the men and women at the square and see if you can send word to our friends in the larger cities. We�ll deal with the vermin ourselves." The boy saluted as Duncan drew his longsword and reared his mount. Galloping directly towards the main gate, it only took him a few moments to reach the battle. Duncan quickly tried to surmise the situation - where the line was weakest, who fought for him and who was nowhere to be seen, and, perhaps worst of all, the visible desperation of the men who stood as the town�s only defense. The defenders were slowly being pushed back. Duncan knew he had to do something, anything, and with a reckless shout, he kicked his horse into a charge. The young paladin�s mount crashed into the line, trampling one orc while Duncan slew another with a quick strike to its head. Duncan barked orders to those near him, trying to bring some order to the chaotic fighting. The arrival of the paladin and other veteran warriors gave the defenders hope, and they managed to gain the advantage, slowly pushing the orcs back. Finally, the remaining orcs fled as the townsfolk let out a roaring cheer. Their cheer was cut short as a shout rang from the top of the wall. Duncan readied his sword and tried to calm his nerves. He shouted orders to the men near him, trying to form a battle line. The front gate was still in ruins and the wooden walls would not stop the orcs. The people of Cove were used to dealing with orc raids, but never anything like this. Help had better arrive fast, he thought, or there would soon be two orc forts east of Britain! Have you been keeping up on the current, ongoing multi-Shard Quest that OSI has been playing out in Ultima Online? There's three BNN articles so far: Dudagog's Tale (here), Prying Eyes (here), and Fallen Comrades (here). UO Stratics has a very nice compilation of related information in their Quest section, here. Fightened orcs and orc scouts seemingly prepare for an impending war. Green-colored masks of orcish kin are found on their corpses, as are dark orcish bows and the new evil orc helms. Be careful when using these new items. They may seem to give you an edge, but they're just as likely to hurt you as help you. We are committed to removing those players that choose to exploit Ultima Online, and will continue to work towards maintaining an enjoyable and level playing experience for all of our players. It�s been a year since I started with the design team for Ultima Online Live. As I sat pondering whether I should comment on any hot topics debated on our web boards, I realized that I am just one person on a large team and any changes/additions being considered could not really be commented on accurately. Those changes can be altered at any point in the development cycle and be very different at the time of release, thus any specific comment I make on upcoming changes could be misleading. I�d like to discuss instead bug fixing by the Ultima Online Live team, rather than new and upcoming changes to the game. Over the last year, I�ve helped squash many bugs in the game. Most of my development time has been bug fixing. It�s not the most glorious of designer tasks, but seeing something fixed, and seeing players enjoying the game more as a result of the fix, is a sweet reward. Bug fixing continues as one of our big challenges for this year. In fact, we have more resources to devote to bug fixing now than we did last year. The past approach of �find and squash� has also been revisited and altered. Along with the previous approach, we will start separating bugs into classifications of bugs and attempting system-wide approaches to the fixes. Time to devote to systematic fixing was not available in the past. You may think that this approach is a �no brainer�, but last year was a busy one, with development split up between many new systems (after I came on the team, not including UO: Renaissance and before) and one expansion product. The developers here devote their time to many different tasks, which are split into different groups. This allows us to work efficiently on the specific areas of the game we are assigned (a few examples are bug fixing for server code, bug fixing for the client that runs on your computer, and new content). The whole team does not stop what it is doing to create an �orc mask�. One or two developers can make an �orc mask�. Quality Assurance maintains a database of bugs for us to review and their priorities. Many of the bugs in the database were submitted by players or brought to our attention through posts on the MyUO boards. Usually, there is not a workday that goes by without someone deliberating over some kind of fix for the game. OSI: Wanted: Let's See Your Homes! Wanted: Let's See Your Homes! "All right, put the throne over there. No, over there - under the big fish. Wait... let's dye the rug. How about green? Or maybe fuschia." Is your home a place of divine elegance? Or is it a shrine to tackiness? Whether you own a tower or a thatched roof cottage, we want to see and hear what you've done with the place! Owners and friends of the house are welcome to submit screenshots and stories of their homes and the styles they've chosen. The wilder, the better, we say! Send your story as an e-mail, with a single screenshot attached, to uo-profiles@uo.com by Friday, June 1st. Please be sure your story falls between 500-1000 words, and include �Home Designs� in your subject line. The screenshot should be in bitmap format, and 600x480 resolution. Please provide a name and phone number for verification of the story. Submissions to �uo-profiles� become the property of OSI and may be used for special events, promotions, and/or advertising. All submissions must be made by the original author and are subject to verification. NOTE: This is a call to see some of the residences of our citizens. Please do not submit shops or establishments for the spotlight - we are always happy to receive these submissions at http://town.uo.com/establishments.html. I regret to inform you that SitePowerUP.com and its services will be shutting down permanently on June 1, 2001. The only exception to this is email. Users who have @sitepowerup.com accounts are welcome to keep them. Since 1997 we have provided services for over 50,000 web sites and have logged almost a half billion pageviews from our users. Those of you with paid service will be refunded a prorated percentage of your current payment after the first week of June. As a service to those in the MMO community hit by this move, here are some providers of free message board services. If you host your own web server, you can also set up your own message board. This has the advantage of not inflicting annoying pop-up ad banners and such on your users. However they can be a drain on your web server and require some (in some cases quite a bit of) knowledge in setting up web applications. Novices are recommended to start with Ultimate BB as that system has a simple step-by-step tutorial and works with almost every web server. In repeated (*sigh*) testing we've found that WWWThreads holds up the best under high-stress conditions. Please feel free to use the Freeborn Press message board, here, to coordinate your message forum changes, and don't forget to check in at the news pages of your favorite groups on their own impending changes. You may have read up top that all the SitePowerUp boards will be closed as of Friday. We'll be moving the BS&R boards most likely away from any outside service. It'll be a part of a Hurm.com group of forums. Don't worry about finding it, you'll be able read about where it'll be on the BS&R news site, and there'll be a link to the new board off the BS&R site. Stay tuned for an update within a week. The Websmiths of Avalon have often explored methods of communication alternate to what may currently be in use. Even if the primary message boards are not accessable, we still need to be able to relay mesages to each other. One such alternative is our Emergency Forums area, originally a testing area for a new form system, now upgraded to be usable when our primary message boards go down. Theyre available at http://www.hurm.com/avalon/cgi-bin/ikonboard/ikonboard.cgi (or look for the Emergency Forums link in the navigation column on the left). These test-turned-backup forums are internal to the Avalon web site, which means that there's no pop-up ads, and they'll be available with the same up-time frequency as the Web site, itself. This is will be temporary too until we can find a more permanent replacement that does not have all the pop-ups. The Bartender can be "tipped" with amounts of gold. Depending on the amount of gold, the Bartender's reply will vary to possibly include a "rumor". Rumors on the Bartender can and will (depending on the size of the tip) be about current scenarios currently going on within UO (game-generated scenarios). For example, a rumor might be about the Orc events that have been happening recently. The game-generated rumors will be kept current by the event system automatically, shard-wide. The Bartender's owner/employer will be able to place one rumor on the bartender. This will allow for the bartender to function within player-created scenarios. Players will be able to decide whether to tip the bartender for a scenario rumor or a �local� player generated rumor. The Bartender will also sell drinks. A contract of employment for a bartender can be purchased at an Innkeeper. Bartenders will be in the various taverns throughout the cities, to support the scenarios as well, with the scenario rumors. However, players will not be able to add rumors to these bartenders. Kneeling down, Gebrek felt the body of a bloodied orc and stared in a moment of confused silence at the disarray before him. More than twenty of his comrades� corpses lay around the campsite in patches of blood-soaked soil, some still clutching the long pole weapons that had slain them. The tents were undisturbed, as was the campfire. His hunting party had hardly been gone long enough for the day fire to move in the sky. He sat still, thinking, trying to comprehend what could slay so many warriors so quickly. It wasn�t until he heard his hunting party behind him mumbling to each other that he remembered his new position of leadership as a poweruser and began barking orders in his guttural tones. As the party spread out over the camp, Gebrek breathed a grumbling sigh. Orcs always obeyed a user of the power, no matter what their age, but Gebrek was still nervous. Not many day fires had passed since he had been considered too young to use the power without guidance from an elder poweruser. And he had many seasons left before he would be powerful enough to be recognized as a mage himself. Or so he thought. Now he was a mage and in command of his own party. That is, what was left of it. Why was this happening? More and more of the young were being named as mages and fighters. Did the clan need the young so badly? Had so many orcs been lost that children were needed to defend the clan? For the first time he could remember the mages had even resorted to bestowing the power on helmets for the warriors. Gebrek couldn�t remember the mages ever putting the power into something for a warrior. Nor could he ever think of a time when a warrior would ask for a way to use the power. Usually both were too proud. Usually one did not need the other. Half of the orcs in his party were too young to be warriors, too young even to be away from the fort. No warrior would be named when he was still so inexperienced that he feared battle, much less run from it as many of the new warriors had. Of course it was hard to blame them. Many of the battle lords who had known great glory as warriors were using the new helmets for an extra advantage. Most of those that had remained with the camp wore them. Now they were dead. And whatever killed them did it quickly and easily, despite the new helmets. He walked around the perimeter of the camp observing the others as they checked their dead comrades and rummaged for anything useful, hoping the sight of orc corpses would not escalate their fear. Slowly small piles of supplies started to form by the campfire and Gebrek began considering his options. Whatever had killed the battle lords would make short work of the younger warriors, with or without the helms. As much as he wanted success on his first outing, he knew that this weak, inexperienced group of fledgling warriors would not be able to make the first strike to find new homes. One of the young orcs lumbered up to Gebrek and grunted, holding out before him what looked like an orc face. Gebrek turned and tilted his head in curiosity. None of the dead had been missing a face. Reluctantly he took it with a scaly hand and almost dropped it in the same instant. This was not flesh! And it held the power! A false face that contained the power... no orc would make such a thing. Again he looked over the campsite. Their best warriors were all dead. No sign of a struggle. False faces that held the power. An unseen killer. Gebrek could feel his youthful fears creeping into him again. Something was destroying his kin. The orcs were running out of time. Tonight on the Baja Shard we will be hosting a fund raiser to help bring about the revival of the old player city, Lumaria. Everyone is encouraged to stop by. We will be accepting donations to help new players gain housing in the city of Lumaria and to rebuild the structure of the city. Afterall, you can't have a player town if there are no buildings! We are accepting all donations, not just money. Anything is welcome as we have a number players new to our world that wish to help, but have nothing. Even if you'd like to just stop by and wish us Luck we would love to see you. If you do wish to make a donation of gold, please give it in the form of a check if it is a large amount. The event will be held in the Counselors Guild hall on the Trammel facet in the City of Britain tonight at 7pm EST. The event will run until we've all gotten fashnickered and can't stand anymore. EA: NetOps has a Deathwish - and he speaks! NetOps has a Deathwish - and he speaks! This update comes to you from Sean "Deathwish" McMains. I started at Origin about 8 months ago as a web application developer after having become dissatisfied with life as a dot-com drone, ironically at another company in the Origin building. After moving downstairs to Origin proper, I was quickly taught to swim by being tossed in the deep water of maintaining our customer management and billing system. In spite of having been a long-time fan of Origin, I'd never actually played UO before coming to work here. Now that I've spent a good deal of time in the game and in the company, I'm convinced that for someone looking for deep gameplay in a Persistent State World there's nothing to compete with UO. (And with UO:3D, we're getting a bit of the eye candy too.) Since we've narrowed our focus solely to UO in the last couple months, we've been able to put even more effort into improving the game and its supporting systems. One recent improvement I'd like to bring to your attention involves the communication between the systems where you pay and the systems where you play. As you know, to play Ultima Online, you have to pay a certain amount monthly. The server that's responsible for maintaining that billing information is completely separate from the server that decides whether or not you're able to log into the game. So, years ago, a system to transfer information from one server to the other was built. Though this system worked fine under normal loads, it would on occasion get a bit behind when there was an exceptional amount of data to move. One instance of this occurred only last month, when we opened a new Japanese shard. The enthusiasm of the Japanese players was such that the shard filled to capacity within minutes of its opening, and stayed maxed out for days. We were thrilled to get such an enthusiastic response from our loyal fans, but unfortunately the database that serves the login servers began to show signs of strain. Though players were still able to log in to the game, our data transit system wasn't able to get its job done as efficiently as we hoped. Our team immediately came together and started moving the data manually to ensure that players who had paid for the UO service would be able to play. This, however, was obviously a short term solution. After analyzing the situation, several of our database experts -- Mike "AviStetto" Howard and Doug Mellencamp most notably -- decided on a design for a new data transfer system that should be more efficient and robust than the one we had been using. After presenting their plans to our supervisors, they decided to go ahead and build the new system, estimating that it would take two days of a couple of our guys' time. They set feverishly to work, and were ready to flip the switch right on schedule. We were all excited to see the results of the work, since the new system was simpler and would theoretically be much easier to maintain than the old one was. They made the switch, and were delighted to see the old system shuttling the data around as much as 30x as fast as was previously possible. Best of all, the very farthest behind it's ever gotten now in the couple of weeks that it's been operating is only about 8 minutes, and it averages much closer to 2 minutes -- far better than we'd ever seen with the old system. This is just one example of the kind of improvements that are being made to UO daily. They're not all big, glamorous things that you notice right away when you log in. But we hope that, as we continue to improve UO's foundations, that you'll eventually notice even fewer interruptions, and will just be able to get down to the serious business of GMing that character you've been working on. Battle Vortex recently was able to interview Pete "Adrick" Warner, one of the designer for Ultima Online. This audio interview is 64 minutes long, and you can go here to listen to it. One of my favorite quotes, growing up acting. I loved acting in plays. Later I got into improvisation and fell in love with it even more. I became addicted to going up on stage with another actor and being given something random by the MC to create a scene with. The whistle would blow. We had to react and start a scene and make people laugh. We never knew what was coming next and by comparison, acting in plays got dull for me. I still loved acting, but improv was and always will be my favorite. I'll get back to that in a moment. So right now we're looking at our big stage, Britannia. We've had this stage for a long while now, and we've done some very interesting things on it. We've changed the set a few times. We added a few magnificent actors with brilliant scripts. Occasionally we tossed in a new prop. Like I said, we've done some interesting things on this stage. Now we want do to something *with* it. We're going to take what resources we have and try out a new style of theater. Ladies and germs, it's time to improvise. Think of us (Cal, Augur and myself) as the MC. We're going to call out a scene bit by bit, and we want to see how you react. We're going to make new sets, build new props, and do some new tricks with the stage. You are the actor. You are the star. How you react is up to your character. There is no script. Now don't think that we've abandoned the idea of a plot! These sets and props aren't a random assembly of ideas. They all go together, forming a cohesive background story. But it's just that, the background. You are in the foreground. This is not a quest engine. That would be handing you a script. We're presenting you with a situation. A change that makes the world itself the stage, a more interesting place for your character to live in and react to. We want to surprise you. We want to keep you on your toes. We want you to expect the unexpected. At the same time, we want you to be able to see what's going on in the background situation and see it react to you. Improvising as you go and living in the situation makes you a part of the plot. This is our first run, so we're watching closely and we're going to be reacting as well. Greetings, I'm writing to inform you of the work that is now in progress to rebuild the city of Lumaria on Felucca. I have dug through contact after contact and have located a former member of the Lumarian Council known as Oceanus. I've been striving to find volunteers that will dedicate themselves and help us bring back the city. Oceanus and I have spoken about raising funds for those who wish to purchase a pre standing house in the area of the city as there are a number of them up for sale. The bridge that was constructed by OSI for the city still stands as well, which is inspiring in itself. I'm writing you because I want to draw peoples attention to this, this city was one of the first to be built, especially on Baja. It lasted for a long time before falling. It would bring attention and possibly even adventure to an area that seems almost barren. If you could do something, a small post even to let others know what we are doing it would be wonderful. My name is Thalanos, Elven Ranger of Baja. I can be contacted at dracusslayer@cs.com or through ICQ at 60316679 for those that are interested. Thank you, and god speed. The Dragoness continues her dogged pursuit of the Ultima team and brings you latest information. When I was originally scheduled to meet with David Swofford to discussion the future of Ultima Online, he mentioned that Paul Sage, Ultima Online's lead designer, would be with him, and Kirk "Runesword" Black, UO's lead programmer and executive producer, might possibly even join us. That was about nine days ago. Since then, both have voluntarily left Origin Systems for parts unknown. So instead of meeting with them, I ended up meeting with David Swofford and Rick Hall. Below is the third of the article's five paragraphs, concerning the new system for events that's under development for UO. One of the improvements that is coming soon is a global event system which will allow for serialized fiction, stories arching over a period of time, which they can use to introduce new storylines, new monsters, new equipment, etc. Each cycle will last about 8 weeks, then another cycle will begin after that. It will even be possible to have different outcomes to the storylines per shard and world, although it doesn't sound like the branching stories will be long lasting. It seems as though once a new cycle starts, all shards and worlds will begin at the same place once more. The log-in servers are not accepting players at this time. Until this issue is resolved, you will not be able to log into the shards. Players who are already connected to the shards will be unaffected. We are working to correct this issue and will update you once more information is available. EA: Sign up for the UO Newsletter! Sign up for the UO Newsletter! Want to keep up-to-date on all the latest news in the world of Ultima Online? From spotlights to shard openings, to news about patches and new systems, the Ultima Online Newsletter is sent out once a month, and only to those who have subscribed. It's coming next week, so make sure you don't miss it - click here to sign up today! Rumor Mill - Sage & Runesabre Gone? I've heard from a few sources that Paul "Sage" Sage and Kirk "Runesabre" Black are leaving UO. As always this is a rumor, but with Sage going to E3 "unofficially" to hang out with an "old friend who is not in the business", it stands to reason (in my deluded mind, anyway) that he is going to see about hooking up with Richard "My Alter Ego is a Registered Trademark" Garriot's new company or possibly to hook up with the Star Wars Galaxies team (either way he'll be with former friends from OSI - OSI has more or less supplied every MMORPG development team in existence with at least 2 or 3 warm bodies). None of this can be confirmed at the moment and its all heresay and rumormongering, but, hey, this is the company formerly known as OSI, where heresay and rumormongering is a way of life. If it is true, we here at The Chosen wish them the best and hope Sage can come up with a better handle than his last name in his future endeavors. For those not familiar with their names, Sage is the current Lead Designer of UO and Runesabre is the current Producer. In other words, this could mean big changes for UO. When worn you take a karma loss but orcs will NOT attack you. Your form does not change, you still look as you normally do. It just looks like you are wearing an ordinary orc mask colored green. Killed 4 orc mages before I found it. Have you ever wanted to meet other UO Players face to face? 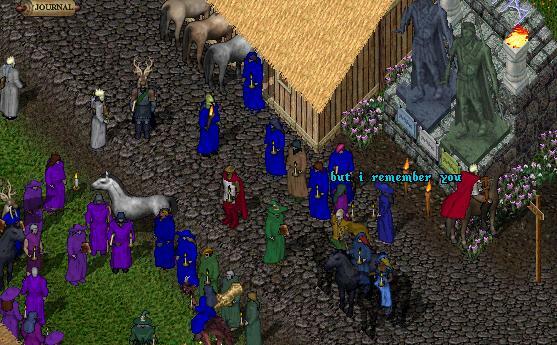 Nearly 1000 players attended the UO World Faire in November 2000 to meet one another, share experiences, and participate in discussions with OSI representatives in Austin, Texas. But did you know that UO players have been holding UO Fan Events in their local areas since 1998? Some annual events are already in their fourth year! To find a player event in your local area, visit the newly updated Luncheons page of the Communities section of the uo.com website. To submit an event that you are hosting, please send an email with the details to luncheons@uo.com. If you don't see an event listed in your area this year, why not consider hosting one yourself? Heather of Great Lakes has been holding Player Luncheons in Texas since October 1998, and she shares her experience in "How to Organize a UO Player's Lunch". If you need advice or support for holding your own player event, you can also email Heather directly at heather@uo.com. Several times a year, representatives from the UO Live Team are able to attend some of the larger player events around the country. During Q&A sessions at these events, players are able to voice their concerns and suggestions directly to OSI representatives, and have some of their questions answered. Even at smaller events, players often have the opportunity to win prizes, such as Ultima T-shirts and CDs, for answering UO related trivia questions or for winning costume contests. If you have questions, tips, hints or suggestions, or would like to participate in discussions about Player Events or the World Faire, please visit the UO Fan Events and Luncheons board. Many of you have seen my name since I pounced onto the boards in March, but some of you may not have any idea who I am. :) I�m Cynthe, otherwise known as Amy Sage in that other thing we call real life. Like many of the recent Comments from the Team, I�ll start off this one with a bit of an introduction. I�m a native Texan, and attended the University of Texas, studying Music, English, and German. In 1998 I was hired on at Origin to help out the Ultima Ascension team with some database work (okay, so it�s a glorified way of saying data entry, but hey, you have to get your foot in the door somehow). After six months of doing some behind-the-scenes design work, I was hired on as a full designer, and stayed on until the game shipped. After that, I accepted the position of Community Coordinator for Ultima Ascension. The position was a good fit for me, because I knew the game well, and� well� I tend to talk a lot. :) In February of 2000 I moved on to the role of Community Coordinator for Ultima Online 2, later to be called Ultima Worlds Online: ORIGIN. This role included weekly website updates, as well as lots of posting on message boards and answering questions in the community when possible. So now on to the present� after the decision in March of 2001 to concentrate on Ultima Online, I moved over to UO, filling the position of UO.com Content Editor/Writer. To say the pace has picked up would be an understatement. I used to think that weekly updates kept me pretty busy. The UO site is another beast altogether� the updates are daily, and at any given point in time there are twenty people waiting for information, updates, and changes done to different sections of the site. Talk about a lesson in scheduling! I�ve had people ask exactly what the Content Editor/Writer does. Well, it's important to note the term "content" in there, since that's my domain. The actual design and appearance of the website, and the coding of the sections is not done by me - we have an extremely talented web team with an incredible knowledge of web design and code. And as for editing and writing, I actually seem to do a lot more of the former than the latter, but that�s mainly because the community�s more interested in hearing the developers talk than the editor. And that�s certainly fine with me! My tasks include things like soliciting/selecting/editing weekly spotlights, Comments from the Team, and the daily alerts (which involves deciphering the emails between the billing department, the network operations group, the development team, and the support group to figure out exactly what these things mean for the players and make sure that there�s something on the site to let people know what�s going on). I�m also now in charge of keeping the site updated, which is a gargantuan task, and one I have only begun. *side note - I�m well aware that there are many pages that could use an update. I�m always cool with getting emails about those pages� I file them into my �list of things to fix� folder. And since I, for some reason, always find it difficult to pull myself away from the community �front line�, I also try to help Melantus on the boards when I can� which in and of itself could be a full-time job. Since I�m much less experienced with UO than Melantus, I tend to focus more on board moderation and trying to keep things reasonable and civil, leaving him free to address more game-related issues. So I�m always open to discussion, and I welcome thoughts on the website (keep in mind there�s no way I can actually take all the suggestions I receive, but there�s always the chance it�ll grab my attention and end up in that �list of things to fix� folder). Another BNN "Orc story" has been posted on the Ultima Online Web site, called "Prying Eyes," here. This is the sequel to "Dudagog's Tale, both of which are the prelude to a large, upcoming, in-game event. Sitting high on a tree branch, the orc scout Milug peered through the branches at the city in the distance. As he watched the humies milling about, completely unaware of his presence as they bought and sold their wares, he could not suppress a scowl. Already he missed his fort near the human city of Cove. He missed the comfort of his hut, the daily brawls, and the occasional forays into the woods looking for prey. Even more strongly, he missed the smell of charred meat in the cookpots and the hoots of laughter as yet another orc mage inevitably earned a beating from one of the lords after setting something ablaze while practicing his arcane arts. Stat loss. Those two words strike fear into the heart of every PK in the game. To understand why stat loss was put into the game, you need to analyze the past of Ultima Online in an objective manner. Originally, the ability to kill an opponent in UO was a way for the players to police themselves. It was a survival of the fittest plan, where those people who bothered you could be killed by you. However, you could also be killed by people you weren't bothering, or kill people who weren't bothering you. The system did not try to divine intent, which is impossible for a game to do. Those who did not wish to be killed could stay in towns, which were basically safe areas. The problem, of course, was that towns were not very interesting places. Other than buying things from the NPC vendors, the only thing to do in town was bank. Even the bank was a paranoia zone, because while murdering was outlawed in towns, sneaky thieves could steal with very little worry of being caught. Players were more wide-eyed and paranoid than a mob stool pigeon on crack in the Sopranos house. At that time, you had to yell "guards" for a thief to be caught, unless an NPC noticed it and yelled for you. Thus many people created the macro "Vendor, buy, bank, guards!" Even towns weren't safety zones, and UO was basically a PvP world. So what did a PvP world really mean? Basically, it boiled down to might makes right. As most of you know, in UO, might is equal to time. The time you invest in your character usually means your character will become better (usually being the operative word, since some people don't spend their time on character growth). Thus those with more time to spend in the world could pretty much beat on (gank / r0xx0r) those who spent less time in the world, or those just entering the world. This, of course, created some pretty severe problems. As the game matured, you started to whittle down your playerbase because new players could not join the game without spending a majority of the time looking at a screen with more black and white than the first season of Gilligan's Island. Some new players were tenacious and willing to stick it out, but many weren't. Even older players got tired of getting beat on because they could not exact retribution. Open to all players from all shards, the annual Florida event is a popular excursion for players from around the world. This year we expect nearly 150 players in attendance and have already confirmed that Runesabre will be joining us as well. Friday night (June 22) we will all be gathering for a dinner/happy hour gathering within City Walk at Universal Studios. This event is not included in the price of the main event tickets. This is a pay-your-own-way gathering. Tickets for the Saturday main event (June 23) will be $50 per person (sorry no discounts for children). Tickets will include the luncheon and entrance into River Country. There will be ongoing door prize drawings throughout the day, as well. You can find all the details on the official Florida Player Event site. Hurry and register today as all fees must be paid by June 1st! And don't forget to purchase your official t-shirt to wear at the event! The deadline for purchasing discounted tickets for the UO Players Lunch at Scarborough Faire, Waxahachie Texas, at 11:30am on Sunday, May 27th is fast approaching. Please pay $30 by paypal or snail mail by this Friday, May 18th. If you have already signed up for the lunch, be sure to check for your name on the Guest List. If you have not signed up yet, please see the Luncheons section of the UO Lunch webpage for instructions. Note: You do not have to purchase tickets to attend this event, but you will have to pay admission to enter the Faire. UO Lunch discount packages include faire admission and a catered lunch. If, after reading the webpage, you still have questions, please email me heatherc@austin.rr.com. Don't forget to purchase your Scarborough Faire UO Lunch 2001 t-shirts, mugs and mouse pads from the UO Lunch Custom Shoppe as soon as possible in order to receive them before the event. Arakasi of the 'Out of Character' comics, who did last year's logo, has created a fresh new design for this year's event. Can't make it to Texas this month? Check out other UO Player events on the Luncheons page on uo.com to find an event closer to you! KingDavid of Sonoma is proud to announce that the dates for the 3rd annual UO Player Gathering in Las Vegas have been set for 2001. Players will meet at the "King's Window" (near check-in) of the Excalibur Hotel in Las Vegas on Friday, June 22, 2001, at 6pm local time. This is the 3rd year we have done this, and its open to all players from all shards. I anticipate that 30+ UO players will be there this year, and I promise it will be fun! If you are interested in coming this year, please icq me at 12875694 so you can get on my list for updates. We will meet Friday night, then walk to a restaurant and talk and have dinner, and then stay as a big group or as smaller groups for Friday night and all day Saturday. Most players will be leaving Sunday to return home, but there are always a few that stay an extra day. Don't Throw That Bouquet Down In Disgust... Weddings Are Still On! In light of the recent demise of the counselor and volunteer programs, the weddings that were being done by counselors faced an untimely end as well. We, the former counselors, wedding coordinators, SRCs, and volunteers have created a bold new plan to ensure that the wedding program does not simply vanish. Many players have already scheduled weddings, or perhaps they are just now realizing that they would like to have a wedding and don't know where to turn. Enter the new cross-shards guild WED. We will be available on the Regions of West, East, and Central to begin with. If you are looking to have your wedding performed and need someone to perform it please keep us in mind, and although we can't make inscribed rings we can perform a ceremony that will do honor to both the bride and the groom. I am Dwight Spaulding, a.k.a. �Melantus�. As you may know already, I�m the Community Coordinator for Ultima Online. The past few months have been strange, difficult, hopeful and ultimately inspirational. There is a lot of desire behind the scenes here to improve UO, and to press forward even harder to make Ultima Online great. This is due in no small part to the relationship we have with our players, and the relationships of the players with each other. Though at times a bit of a bumpy road, our communication with the players has helped to directly shape UO and influence our way of thinking over the past months and years. Of course, that is all dependent on information flowing into our ears from you, and out of our mouths to you. And this is something I�d like to talk about more: communication. Communication is perhaps one of the more difficult aspects of an online game. How players see the game and the company that runs it affects not only their willingness to continue to play (and pay for) the game, but also how they feel about future games that a particular company might release. Of course, there are hundreds of thousands of players in today�s online games, and pleasing all of them all of the time is impossible. So at any point in time, someone will be hating (or loving) the game they play and whoever operates it. One question that players have asked of me is why we aren�t more open with them with our ideas or our plans. To some degree we are, but this is an area that has unfortunately been the source of trouble in the past. We certainly like to talk to the players about UO, and listen to their ideas about the direction the game should take. But about �wishlist� discussions, or even regular updates� why are they worded like �political� talk? Well, we can�t talk about systems off the top of our head that we haven�t thought out, or done initial design documentation on, or at least considered in a balancing regard, because what we say winds up getting taken literally, or even somewhat misquoted at times. Also, if we sound positive about a system or design, we�d better be working on it, because players that like the idea will be expecting it to get actual attention and progress. Even for just a brainstorm session idea, you say? Surely not! I have had feedback from players telling me that they can easily distinguish between something that�s just an idea and something that�s been promised. And I�m sure that concerning those people, that may be true. However, we have a very large community, and even just this week there have been two examples of our words being misinterpreted. So what difference does it make if we talk about something that is just an idea? Who cares if some people mistakenly assume that this conversation about the idea is a promise to deliver? Well, I care... because it means the integrity of our word. Whether we can deliver what we talk about is much more important than one might realize. Do we have a lot of fanciful ideas but no delivery? I would rather us take an idea - even if it�s based on the many great discussions on the UO Boards - and put a bit of necessary thought and research into it before openly talking about it with the players. Does this mean we don�t or won�t talk to the players about our ideas and the great potential for UO? No, we do a lot of talking with the players, and will continue to strive for that, but there is a need to be careful of what is said. In perhaps no other business besides politics is the words/information said looked over and examined so closely by the public. This is a good thing overall, because it definitely shows high interest. It also shows an unwillingness on the players� part to just �take whatever is given� by the dev team, which is something I consider healthy for the industry. It means responsible communication by us, with the understanding that we need to not be so tight-lipped that our players feel we�re off in an ivory tower. I would rather we be respected for being able to deliver what we promise. I also want to try and minimize misunderstanding of what we say by posting clear information. Players still do get input into our changes and the direction of UO - more than they perhaps realize. Changes go into testing before release, where players can try the change out and give us feedback. We are open to the feedback, and have made many changes to upcoming systems based purely on that feedback. We also watch the boards, and see all of the �wouldn�t it be cool if...� posts. All of this affects UO�s direction. So players are involved to varying degrees, some of those degrees being quite involved. Being more open with the players is something I�d like to work on, as long as there is no compromise of our integrity. We will be conducting database maintenance on Tuesday, May 15th between 5:00 am and 8:00 am CDT. During this period, players will be unable to make account changes, including reactivation, creation, or cancellation. We apologize for any inconvenience this may cause. We will be releasing a client patch on Monday, May 14th at approximately 2:30 pm CDT. This patch will contain art changes and updates, an updated credits file, and a bug fix to allow players to sell items to vendors in Ilshenar. The current versions should now be 3.0.1a (2D client) and 3.0.1d Build 63 (3D client). BYOR! There will be craftspeople of every sort represented to craft items for you at no charge when you provide the materials. Smiths, Tailors, Bowyers, Tinkerers, Carpenters, Scribes, Alchemists, Chefs and Poisoners, the entire crafting community of Heaven's Forge will be represented. Door prizes will be awarded throughout the event. Following the Crafter's Faire, wander with us across the valley for the Grand Opening of the Celestial Spirits pub, a rooftop alehouse hosted by Darius, Mayor of Heaven's Forge. The pub sits atop the Ring of Steel guild tower, and there will be free drinks and food all afternoon. Richard Garriott, creator of the Ultimas (including Ultima Online) and late of OSI/EA, has begun the process of announcing plans for his next project(s). He's got a Web site up for his new Company, "Destination Games," located at http://www.destination-games.com/. There's nothing there yet except for a "splash page," but you can bet the players and producers within the gaming industry are all watching eagerly. Today players gathered from all over Sosaria to honor the senior counselors, counselors, elders, and seers that have served the community. What started as a small group at 6:00 PM soon grew into a large crowd. Everyone donned a colored robe and held a candle. Soon people started talking about their memories of the volunteer program. I overheard many players from the community giving heartfelt thanks to the seers and counselors who have helped them over the years. The following ex-volunteers came tonight: Eliar, Meredith, Lady Geri, Justinarius, Tearyl, Lord Jim, Cupid, Athena, Illithana, Tar, Paul, Tarragon, Takara, Gar and Verkat. The sentiment of the gathering seemed to be "I can't believe its over..." One of the ex-counselors said "It was over too soon! I just went solo three months ago...I was so excited." She was not alone in her sadness. A seer in training for Baja also said, that he was only days away from earning his robes. It was a privilege to get a chance to talk to the volunteers that have helped us, entertained us, and been there for us. Each one in their own way helped to make Baja a better place. They will be remembered. Electronic Arts has posted its fourth-quarter results, beating analysts expectations for the company's quarterly loss by a penny per share. Consoldiated net revenue for the fourth quarter was $307.3 million, up from $294.3 million in revenue for the same period last year. The consolidated net loss for the fourth quarter was $17.9 million, or 13 cents per share, compared with net income of $3.4 million (3 cents per share) for the fourth quarter last year. The company incurred a one-time pre-tax charge of $2.7 million in the quarter related to the acquisition of Pogo.com. For the fiscal year ended March 31, 2001, Electronic Arts reported net revenues of $1.322 billion, compared with $1.420 billion for the prior fiscal year. The company posted a consolidated net loss for the year of$11.1 million (8 cents per share), compared to the prior year's net income of $116.8 million (88 cents per share). CEO Larry Probst said in a conference call to analysts that he expects the company's 2002 operating income to increase 75 to 90 percent on a year-over-year basis, estimating revenue growth in the mid-teen range. Origin Systems has always been to me like some Ivy League college, an institution beyond my reach or means. Many refer to it as "Origin U," a place where young, creative people went to learn if they had the chops to make games. Attending Origin U required starting at the bottom � usually working in the QA department or as a technical design assistant � and working outrageous hours for very little pay. A college degree was as helpful in getting into Origin U as it would be at an Army boot camp � more of a handicap than anything else. It certainly seems a sad ending for one of the founding institutions of our industry. Some will no doubt blame Origin's demise on the "suits" at Electronic Arts, but I suspect the company culture was also to blame. There is no doubt that Origin's development teams demonstrated creativity and vision aplenty, but according to many ex-Originites I have known over the years, the teams were often plagued by a lack of engineering discipline and productivity, relying heavily on the efforts of a dedicated few. There is probably an ex-Origin employee in your organization who can attest to this. The age of heroes is past, and while we remember the buzz of those wild days, we should also remember the wasted human effort, personal lives, and money which could have gone to worthy projects instead of keeping developers in the manner to which they had been accustomed ["...when content was king and developers controlled the concept"]. Join with friends old and new to celebrate the Interest People of Baja. They may be gone, but let's show them how much they meant to us with a Tribute. Friday night (Tonight) at 6pm PST please gather at the Counselor's Guild in Britain, Trammel (Large wooden building with new statues next to it, behind the large mage shop). Wear Blue (Counselors), Purple (Senior Counselors), Brown (Elder) or Green (Seer) colored robes and carry a candle in honor of these people who have spent countless hours bettering our lives. Last night, monuments to the Volunteers of Ultima Online we placed next to the Counselors' Guild Halls in Britain on all Shards, both Felucca and Trammel facets. The monument, as shown in the accompanying screenshot, incorporates several foundation blocks and adornments, including two statues (one blue, seemingly representing Counselors, and one green, seemingly representing Seers, Elders, and Troubadours) standing over three plaques. The first plaque, tinted blue, reads "In recognition of the Counselors of Britannia, who have brought the light of knowledge to the people of this realm." The second plaque, tinted grey, reads "In recognition of the Volunteer Testers, who have helped exterminate the vile insects that occassionally plague the integrity of the realm." The third plaque, tinted green, reads "In recognition of the Seers, Elders, and Troubadours of Britannia, who have inspired the world with their legendary tales." As all of you probably know, for obvious reasons, we are limited in what we can say about the volunteer program going away. What I can say, and what I think needs to be said is "Thank you." Sincerely. I have been associated with Ultima Online as long as anyone. I saw the birth of the volunteer program and I watched the first people get indoctrinated into it. Yesterday I saw people questioning the motives of Counselors and Seers, and that stunk. I don't want to go into a long diatribe, I just want to thank you for your passion, your kindness, and your willingness to help others. I hope you continue to show that same Compassion in all of your endeavors; it is a strength, not a weakness. It was just today that I heard the sad news that all the counselors have departed the land. One of the most important duties that counselors performed was to join couples in marriage. It is in light of this development that I wish to announce that the Tiberian Temple is available to perform wedding ceremonies. The Tiberian Temple's Philosophers have served as virtuous guides for many of Britannia's noble adventurers for some time now. Their duties have also included officiating weddings of some of the most prominent people of the land. Your notice mentioned that the volunteer programs had been "reassesed". What factors specifically drove this decision? In particular, was the ongoing ex-volunteer lawsuit pending against EA a factor in this decision? As the lawsuit is still in the early phases, and there won't be a decision on it for a long time, the decision was an independent one made by EA to change the business structure. So this decision was taken by EA as opposed to Origin Systems? Yes, the decision is company-wide. We also asked "Terendil", the ex-volunteer who is the main litigant in the lawsuit against EA that still is in progress, for her reaction to this news. I'm not surprised, given the issues that existed in that program. I'm also not surprised, given the current state of AOL's lawsuit and our own. Also, the fact that EA has been making some extremely poor business decisions such as cancelling UO2, may mean that they may simply no longer have the customer base to maintain a volunteer program. I'm terribly sorry that this affects the wonderfully dedicated volunteers that will no longer be active in the game community. This does not affect our current lawsuit. In the coming weeks and months, Ultima Online players will begin to see changes to the UO experience that will affect and impact the game in many ways as we update systems, introduce new content, and continue to grow and expand the world of Britannia. In addition to systems and design changes, we will address how Origin supports Volunteer programs. Effective today, May 9th, Ultima Online will no longer host Interest, Quality Assurance, and Counselor Volunteer programs in North America and Europe. Though it�s a difficult decision for us, it is based on the reassessment of our online, company-wide business structure as we address growth and changes in the online entertainment industry. As a result, volunteer programs throughout all of Electronic Arts have been affected by this reassessment. This decision does not affect the existing volunteer programs in Japan, nor does it currently affect the Companion program. Whether answering questions, creating intriguing and amusing events, or aiding their fellow players in any number of ways, these volunteers have enriched their own Ultima Online experience and helped fulfill the Ultima Online experience for so many other members of the UO community. A permanent acknowledgement to these volunteers will be placed on both facets of each affected shard, located near the Britain Counselor Hall. Over the last several years, players volunteering in Ultima Online have assisted their fellow players with great creativity, aptitude, and grace, and our thanks go out to all who have participated in these programs since their inception. This commitment to UO, as well as the commitment of hundreds of thousands of players worldwide, is the foundation on which we hope to grow and support the game far into the future. The water elemental, being one of three completely amphibious beasts left in Britannia, is a natural choice of mages fighting from their ships. While summoned daemons might offer better spellcasting and melee abilities, the water elemental does offer the ability to launch off the deck of one's ship and move freely on the waves. Unfortunately, there's a few problems with this ability. First and foremost, the ship's plank must be unlocked and extended for the summoned water elemental to disembark onto the water. And then, there must be an arranged line of sight between the elemental and its target lined up so that the elemental is coaxed into doing so. In other words, if the target is off the bow, the elemental will make a straight line for it and stop at the front of the ship. The target must therefore be off to the side a ways when the command is issued to attack. In tonight's UO House of Commons chat OSI was finally presented with a comprehensive question about the state of ships and sailing in Ultima Online, and their response came as quite a surprise. The question was answered by UO Dev team member Vex who offered specific issues that will be addressed in the "publish after next". We have some improvements for ships in the works for the publish after ext. We plan on addressing shoreline blocking, boat security and several other issues. Unattended ships left along the shore have been a problem since the beginning. Before the ability was added to drydock and recall to one's ship, the docks of every city and the shore surrounding it were clogged with ships at all times. The problem of unattended ships has shifted more now to high spawn areas and long open stretches of north-south longitudes. So what solution is in the works for ships that block areas along the shore? A faster decay rate along shorelines (that'll take care of my neighbor's 10-ship- never-moves-bank-boat-flotilla)? Automatic drydocking at server up with any items in the hold being deleted? In-character "storms" that sweep unattended ships near the shore out to sea? Boat security is a term that could cover several aspects of ship security. They could be working to eliminate certain long-standing tricks to board locked ships. Another possibility is to give the ship more owner-related status as is the case with housing in the game. Currently, saying "I ban thee" on one's ship does bring up a targeting cursor, that has no effect on other players or monsters. Perhaps the ship's placer and key-holder may be designated the owner, and the tillerman might gain additional functions of some sort. Or maybe all they are going to do to make ships more secure is to make all ship keys "blessed", which will really irk the thieves I know. Whatever changes they make, these will be the changes that every player who owns a ship will need to know. No hint was made here that anything other than ships themselves are being looked at. The issues of changing the seas themselves to make ship use more interesting, by creating some new and different monster spawns for example, will probably come only after the ships themselves are working better. It's going to be a long summer. This is great news, though. Rumors of orc sightings and talk of missing sheep has been percolating through some of the towns of Britannia. Could this be a natural migration? Some of the resident orc experts don't think so. "Well, I used to see orcs all the time near my house in Cove, but I haven't seen one for days," reported Dwiggit, a resident of Cove and a long-time orc hunter. "They didn't even come around when I replanted my garden, and they've trampled that garden every season for two years." Well, whatever the reason, it can only be assumed that the orcs are moving. Why? No one knows... except perhaps the orcs themselves. A sore eye encrusted with blood, received as a �blessing� for questioning the elder shaman during the previous night�s war council, was a minor irritant in a long line of irritants that Dudagog had learned to accept. Although it had been only twenty cycles of the day fire since the shaman council had rolled the bones and driven the tribe to move, Dudagog could barely remember the logs and bone piles he called home. He could remember the rich hunting ground though. Always fresh deer and hummies to munch on, and the strength of a combined tribe of hundreds had made life as good as it gets for an old, fat orc. In his younger days Dudagog would have perhaps enjoyed this nomadic lifestyle, but age had given Dudagog a wisdom that only comes through corpulence; hunting is good, but sitting down for a meal is better. Thus when Dudagog had questioned the shaman about the wisdom of his training the young orcins to hunt with the new long way killer, the shaman elder chastised him with a swift staff to his eye. Dudagog was not stupid enough to retaliate in kind, as the shamans had been known to cause the air around an orc to burn as hot as the home of a lava lizzie. Read the entire "Dudagog's Tale" here. Everyone has a special place that will always feel like home. For some people, it's the town where they started their first character, armed with only a few meager possessions. For others, it's the player-run town where they set up their first reagent shop, or the tavern where they met the person they'd eventually marry. Tell us your story of the place you call home, and let us know what's special about it! Send an e-mail to uo-profiles@uo.com by Friday, May 11th. Please be sure your story falls between 500-1000 words, and include �Hometown� in your subject line. Please provide a name and phone number for verification of the story. Submissions to �uo-profiles� become the property of OSI and may be used for special events, promotions, and/or advertising. All submissions must be made by the original author and are subject to verification. Effective Monday, May 7th, the Oceania, Siege Perilous, Formosa, and AOL Legends shards will be updated to a daily maintenance cycle. Maintenance on these shards will take place at their regularly scheduled times. The downtime schedule located at http://support.uo.com/downtime.html will be adjusted on May 7th to account for these changes. As we begin public testing of veteran rewards, I believe this is a good time to stop for a bit and discuss it. If I�m correct, many of you are thinking, �What happened? Why was the system so late in the first place? Why is it so late coming back?� Well, I hope to answer many of those questions in the following paragraphs, as I explain the history of veteran rewards from the beginning to the present. I apologize in advance for the lengthy nature of this document, but as we all know, veteran rewards have been in development for a long time! I want to preface that explanation with a very short account of my history here at Origin. I started working on UO in September of 2000 as a server programmer, dealing mostly with the back-end server systems of UO. Since then I have touched just about every section of code in one way or another, either through bug fixes or new content addition to all the various servers and both clients. My first encounter with veteran rewards was in November of 2000, so all my information from before that time has been re-constructed from conversations I�ve had with the various developers who have worked on veteran rewards. �Ok, so what�s so special about veteran rewards and why is it so complicated? After all, you did the Christmas gifts without a problem!� Well, with veteran rewards, we are trying to distribute a limited amount of gifts by account over all shards rather than by the number of established characters per shard. There were several reasons for this - for one thing, storing extra data slows backups down and generally decreases the performance and lifetime of the server. As well, by distributing fewer gifts, we make them more intrinsically valuable to the players. So everyone involved at the office decided that the idea of distributing gifts by account was great. Right from the start, two significant issues were recognized as problems that would have to be solved. The first was that shards had never talked to each other before - ever! So we were going to have to design and implement a method in which they could trade information, and have this system operate in real time. The second momentous task was the calculation of account age. As it stood, a shard knew how old any one character was, but did not know the amount of billed months an account had. That information was stored in a database deep in the heart of the operations group - a completely different team than the UO live group. The task of getting the account age to the servers was given to the operations group, and the live team took up the task of getting the servers talking to each other. Development continued for a while as planned, and things appeared to be working out well. In the summer of 2000, problems surfaced in the account age determination method. The operations group suddenly discovered that the method they had designed was hindering operation of one of the back-end servers. They informed us that they would need to redesign their solution. In an effort to keep to the planned release date, it was decided to attempt to solve the account age problem from within the UO Live team. The UO team then started work on a completely different way of calculating the account age. The new method showed promise, and the shards were successfully talking to each other, so rewards were opened to the public for testing. This is about the time I came aboard. The programmer primarily responsible for veteran rewards was moving onto another project and they needed someone to maintain the system. I was given that responsibility. During the initial testing phase, we received quite a bit of concerned player feedback, which convinced us to re-evaluate the rewards. We pulled rewards from testing and re-designed a number of the reward choices. By this time, veteran rewards was a few months behind schedule, and with factions on the way we were running out of resources to develop and test rewards. Factions were just about ready for launch, so a push was made to finish it. Development on rewards was frozen during this period. Just before the Christmas holiday, we had a meeting on when we would launch rewards, detailing a plan that would launch the system without interfering with the final developments of Third Dawn. A major push was made to test the system and eliminate any bugs. It was launched on Sonoma, and a major problem was found and fixed. We then proceeded to launch on the rest of the North American and European shards. I should pause in the story to mention some of the flaws in the system that we only found later. The veteran reward system was initially designed as a simple data storage system. Over time, it has been modified to be specific to veteran rewards. During all these modifications, one of the primary design goals was to have multiple safeguards to prevent a player from ever losing a reward during a backup and not being credited for it. The failure here was that little was implemented to prevent people from getting more rewards than they were supposed to. This is the point where things really went awry. First of all, the central data server was getting requests for account age and reward information over 200 times a second. The problem was that each of the calls took half a second to compute. In other words, every 60 seconds the server was getting 100 seconds worth of work to do. This meant delays that quickly grew out of hand. People soon had to wait 5, 10, and even 15 minutes before they got to choose rewards. Then, to make matters worse, the server system would run out of memory at times, after which it would halt all work and try to reclaim that memory. This reclaiming period took approximately half an hour. Of course, during this 30 minute period, requests for information kept piling up, making the delays even longer. So our first pressing issue was that it was taking over 500 ms to calculate the account age of a player. This was aggravated by aggressive information polling on the shards that caused it to �hit� the data server more often than it really needed to. We immediately got to work to come up with solutions as fast as possible. Within a day, we had come up with stopgap solutions to both these problems, and by prime time the next day we were looking much better. Things appeared to be working fine, except for a trickle of reports from the player base that people were getting extra rewards on the European shards. We quickly investigated these reports. Part of the veteran reward system gives us the ability to see who is taking what reward, and how many rewards any one account has taken. Our generated reports told us that everything was fine. Little did we know that the server was telling us this because of a flaw in the program that was corrupting the data. The next day, the trickle continued, so we looked a bit harder at our reports and checked the raw data. Eventually we found one possible loophole that could have caused a few extra rewards. This was immediately fixed. However, we still hadn�t found the more serious flaw mentioned above. In a few more days, the trickle had become a flood. I just couldn�t believe the server would be lying to me - all the tests we ran showed things were working just fine! At this point, we looked hard at the raw data and uncovered some striking discrepancies in it. It was then that we finally found the problem and pulled rewards. We stepped back, took stock in what had led us to this point, and discussed what we could do to fix rewards. A fix was found for the flaw but no one wanted to re-launch the rewards system without putting it back on a test center. The problem at this point was that we didn�t have the resources to test rewards, as we were well into the alpha of Third Dawn. In order to keep from skipping around and dividing our focus, it was determined that all development had to be put on hold until after Third Dawn launched. After the release of Third Dawn, we took another long look at the rewards system. What we found was that too much had been patched into the system since its original design, adding too many unknowns. It was determined that we would clean up the back-end system. Over time, what started as a clean-up and an attempt to add more fail safes turned into an almost complete re-write of the system. The new system makes sure players will always get their allotted number of rewards, no more, no less. We also added more tracking and logging information, and we should be much better equipped to analyze what�s going on in the future. So that�s pretty much were we stand today. We hope that you will take the time and test our rewards on our test shards. The more people we have trying out the system, the more confident we will feel that we indeed have a stable and robust system. In appreciation for participation in the Ultima Online: Third Dawn Alpha and Beta Tests, we are extending the following special offer allowing Alpha/Beta testers to order one of our collector�s edition, full-color cloth maps of the original and Lost Lands of Britannia. This offer includes the map and cost of shipping for $5.95 domestic (U.S., Hawaii, Alaska, Guam, U.S. Virgin Islands and Puerto Rico) or $6.95 International. To purchase the map as part of this special appreciation offer, please visit http://www.uo.com/tyou. You will be asked to enter your Ultima Online account name/password to validate your alpha/beta participation status. Please note that you must use the Ultima Online account name for which you registered as an Alpha or Beta participant. Shipping and delivery times may vary, but most domestic orders should be received within 10 business days and most International orders should be received within 21 business days. As Caf�Press will be fulfilling these orders, your credit card statement will show billing from CafePress.com. After completing your order, any questions related to order tracking or shipping should be emailed to customerservice@cafepress.com. Ye are cordially invited to join Emperor Azalin Lore and Lady Cymidei Fier in celebration of their First Anniversary. May 6th, at 6 Pm PST at the Golden Brew. Counselor Mystic shall preside over the ceremony. Feasting, hunting and merriment to follow. The Great Sea Hunt - Fifty nets will be thrown into the sea causing all manner of krakens, sea serpents and water elementals to arise from the depths. All treasure will be given to the guests! Boat Decorating Contest - Creatively embellish your vessel with flair and ye may be the lucky winner of a 50,000 dollar purse! The Great Yacht Race - The first ship and crew to sail from Lore Island to Vesper shall receive 100,000 gold. As UO nears its fourth birthday, which is an amazing feat for a game that was only supposed to last one year and garner less than 50,000 players, we are focusing more on what got us to this point and how we can keep the game exciting for another four years (at least!). Specifically, we are thinking about what our players want from us as a committed company and how we can keep both the in-game and community experience thriving. To that end, we are looking to conduct a number of focus groups and online surveys this year, and solicit the feedback from our players on what their needs are within a number of areas - so look for those in your email box if you have opt-in status. We understand that some players have felt that their feedback has gone unheard, but the truth is that it is more likely used much more than you might think! We do hear and implement individual player feedback, but often in a subtle way that integrates other ideas as well. We also want to bring our community more into the forefront of our thoughts and deeds by re-invigorating the website, and adding some new promotional content, thereby providing opportunities for our players to have some fun while visiting the site and maybe win some UO goodies as well. Additionally, we are looking at ways to promote exciting events and player stories within and across shards, as well as enhance our tips and tricks related information to enable more of you to gain insight on how to prosper in Britannia. Finally, we are considering hosting another UO World Faire. There was a strong turnout last year and we received a lot of great feedback on how to improve on the original model. It is not a �sure thing� but we are keeping our fingers crossed that we can make it happen. So, if you have any thoughts on the Fan Event front, be sure to bring them up on the UO Fan Events and Luncheons or the Discussions Board; we would love to hear them. Our goal this year is to focus on our most valuable asset - You, our customer. So, don�t be shy - use the Boards and let us know how we can improve your game-play experience and your website experience. And, when and if you meet us at the Fan Event, hey, maybe we can sip some ale and you can tell us how we're doing! On Wednesday, May 2nd, Origin Systems (OSI) was alerted to the possible misconduct of an individual employed within the GM Support Department. Upon investigation, OSI found reason to believe that this employee was engaging in activities that breached the trust that must exist between a company, its employees, and its customers. The decision by OSI management in this case was immediate dismissal. All actions that are taken by members of our support staff are logged and monitored, and we investigate all reports of GM misbehavior that we receive. We are grateful to players who bring these incidents to our attention, as these reports are used to ensure that OSI representatives are providing the best possible service at all times. If you believe that a GM or any OSI representative is behaving in anything less than the highest standard of service, we ask you to please email uoconcern@uo.com with the details of your issue. Only the most senior representatives of our support staff read this mailbox, and we assure you that your issue will be thoroughly investigated. We take our responsibility to our customers very seriously, and we will not allow anyone  staff or otherwise  to abuse our terms of service or the trust of our customers. We will be taking down the login server database to perform emergency maintenance upgrades on Wednesday, May 2nd at 11:00 AM CDT. This maintenance period is expected to last approximately three hours. During this time, customers will not be able to log in to any Ultima Online shards and any account changes, updates, or creations will not be activated until the database maintenance is completed. Customers who are logged in to a shard prior to this time will not be disconnected, but will not be able to reconnect if they do disconnect. We apologize for any inconvenience this may cause. My last comments were back in November around the time of the UO World Faire, an event I enjoyed very much. It was fun to meet the players and hear what the community had to say about the game and the future from their individual perspectives. In these Comments, I thought I would take some time to let people know what it is I�ve been doing over the last several months and what I am currently working on. Right after the Faire, I was given the assignment of managing a new project - localization - from the design side. What a task it was, and we are still working on it! It was a huge learning experience for me, and even to this day the magnitude of what we had to do is mind boggling. Our goal was to make the game accessible to non-English speaking players with as minimal an impact on our current playerbase as possible. This was challenging, because when the game was originally designed it was not done so with the intent that it would be localized. Many things had to be rewritten - some from scratch - to accommodate our supported languages. During this process I learned a ton about how the game works. I was on the project for about 4 months and over its course I made changes to over 500 scripts - the biggest portion were all of the gumps in the game. Things like the house gump, the faction gumps and the guildstone gump had to be rewritten to allow them to be localized. So why localization? I�ve heard that question a lot. The reason we localized UO is to expand our playerbase by bringing UO to people that would not have any interest in playing the game because of the language barrier. The result of this is that as the UO playerbase grows, our resources from the development side will as well. The current team is the largest ever in the history of the game - the prospect of a growing and expanding playerbase is what allows us to do this, and that means better quality content delivered on a more regular basis. Now that Third Dawn has shipped, the designers have once again been given areas of the code to manage. I�m very pleased to be working on the faction system, the guild system, and all player/player interactions such as reputation, trade and the party system. All of these areas are of great interest to me, and as we move forward it will be my primary focus both to clean these systems of bugs and exploits and to stabilize them. I am currently working on fully documenting these systems and identifying the bugs that need to be fixed. I�m particularly excited to be working again on the faction system and building on the initial design that I helped write and code when I first joined the team almost a year ago. I think the faction system can be improved and expanded in many ways. The area I am most concerned about is the amount of blue interference that is occurring in and around the strongholds and in the 8 faction towns, and I am working on several ways to limit this or remove it altogether. In addition to this problem, I'll also be focusing on other bug fixes and balancing issues over the next few weeks. The second area I am responsible for is the guild system, which I think is one of the most important systems in our game. It is a great community builder and organizer, and a way for people to work together towards a common goal. I expect to be spending a lot of time making these two systems work together, as they overlap in many areas and depend a lot on each other. The final area (player/player interactions) is also a challenge. I�ll be responsible for making sure that these interactions are bug and exploit-free (mostly regarding scams), and working to provide the players with a comfortable experience when interacting with other players (at least from a game mechanics standpoint). Well, that�s it for now - thanks again for your time, and as always feel free to contact me at my email (Adrick@uo.com)or on the boards with suggestions, ideas and concerns. The account management site is experiencing considerable delays in updating information. We apologize for the inconvenience this may cause for players and we assure you we are taking steps to resolve these delays.